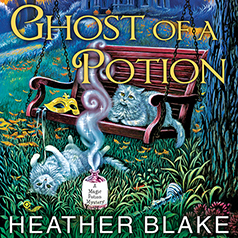 In the latest novel from the bestselling author of One Potion in the Grave, it's Halloween in Hitching Post, Alabama, and potion shop owner Carly Beth Hartwell has an especially spooky customer to handle . . .
With all the ghosts that haunt her at this time of year, Carly doesn't exactly rush to celebrate Halloween. Even a costume ball organized by her boyfriend Dylan's mother, Patricia Davis Jackson, holds little allure. But to please Dylan, who wants peace between the two women, Carly reluctantly agrees to go. The gossip around town is that architect Haywood Dodd plans to make a big announcement at the party. But before he can address the crowd, he's found dead with Patricia standing over him, holding the murder weapon. Anxious to clear Patricia's name and perhaps broker a truce with her, Carly would love to use her snooping skills to find the real killer. Only she has bigger problems to deal with—ghosts are flocking to her for help, including a very persistent Haywood Dodd . . .
"[Carla Mercer-Meyer] does a great job with this series." ---Books, Movies, Reviews! Oh My!